Tripping over them hurts (a public liability nightmare). They are bad Feng Shui because they are considered tomb stones. The tree removal job isn’t really finished. They can cause new unwanted tree growth. They take up precious yard space. 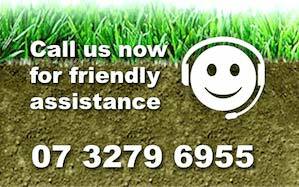 For any tree stump grinding or removal enquiry in Brisbane, please contact our friendly staff on our number listed below for a fast response. Thank you for considering Just Stumpgrinding for your stump grinding and tree stump removal inquiries. When we decided we wanted to be the most efficient tree stump grinding business possible we invested in more machinery. We actually bring three (3) different sized stump grinders to your job site. Our larger grinder needing 900mm access, our mid sized machine needing 740mm access and our portable or hand held stump grinder that can be carried if needed to your job site. Our large stump grinder has plenty of direct drive horsepower to take care of the largest tree stumps. We need 900mm access to get this machine to your site. 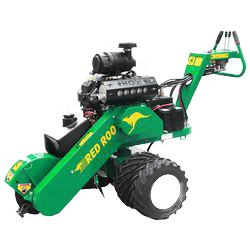 Our Red Roo stump grinder has lots of horsepower for those jobs where access is a little challenging. We need 740mm to get this versatile machine to your tree stump. 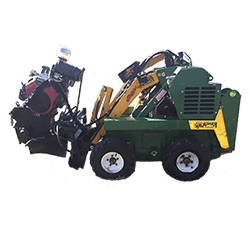 Our portable or hand held stump grinder is for those really difficult access jobs. We can carry this machine if needed. Down stairs, on retaining walls or under decks. We are a customer focused Brisbane business determined to providing you with an outstanding tree stump grinding service. Our eighteen years of experience, has given us a full understanding of every aspect of tree stump removal and stump grinding. There is no substitute for experience. 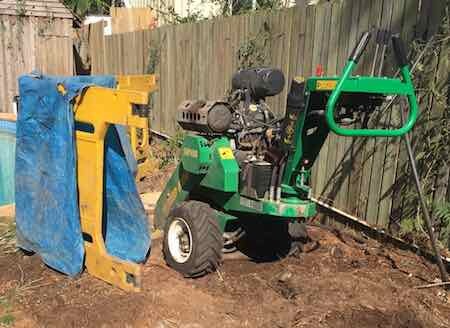 When it comes to tree stump grinding in Brisbane, remember us Just Stumpgrinding, it’s our specialty, grinding tree stumps, and tree roots in gardens, on retaining walls, just about anywhere you can find a tree stump. By the way, we have even had to grind a tree stump under a persons house, with very limited work space. We were able to do the job with our portable stump grinder. Just Stumpgrinding is Brisbane’s tree stump grinder. It is our specialty, grinding tree stumps, in gardens, on retaining walls, anywhere you can find a tree stump in Brisbane and Ipswich and it has to go…..Give us a call, our prices may be cheaper than you think. A phone call is the quickest way to reach us. We would love to hear from you soon. 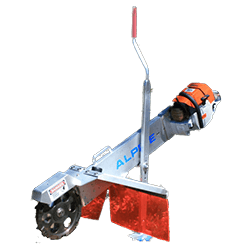 Our tree stump grinders are available to get rid of those troublesome tree stumps.